The top U.S. intelligence official said Saturday he meant no disrespect to President Donald Trump in a televised interview discussing the summit with Russian President Vladimir Putin. Director of National Intelligence Dan Coats said his Thursday comments at the Aspen Security Forum in Colorado were not intended to be critical of the president's decision to invite Putin to a meeting in Washington later this year. "Some press coverage has mischaracterized my intentions in responding to breaking news presented to me during a live interview," Coats said. "My admittedly awkward response was in no way meant to be disrespectful or criticize the actions of the president." 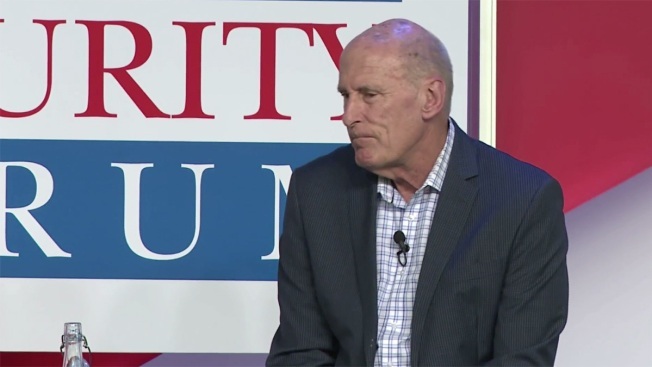 Coats has been under scrutiny since he said he wished Trump had not met one-on-one with the Russian leader and expressed dismay that the president had publicly undermined U.S. intelligence agencies. Coats issued a rare statement rebutting the president's Monday comments during a press conference with Putin doubting the findings of the intelligence community on Russian election interference. White House aides were fearful that the former lawmaker might resign over the president's comments, and the president spoke positively of Coats in a television interview Wednesday. But Coats' display of surprise upon learning that Trump had invited Putin to Washington this fall for a follow-on meeting drew the president's ire. "Say that again," Coats said, cupping his hand over his ear on live television. He took a deep breath and continued: "OK. That's going to be special." Coats also revealed in the interview with NBC's Andrea Mitchell that he was unaware of what transpired in the private meeting between Trump and Putin in Helsinki, and restated without equivocation his belief that Russia continues to pose a threat to the American electoral system. "Basically, they are the ones that are trying to undermine our basic values and divide with our allies," Coats said of Russia. "They are the ones who are trying to wreak havoc over our election process." Coats, who oversees the nation's 17 intelligence agencies, also said that if he had been asked, he would have advised Trump against meeting Putin alone, with just interpreters. "That's not my role. That's not my job. It is what it is," Coats said. The statement Saturday from Coats, more than 48 hours after the initial interview, capped a week of public walk backs by the Trump administration relating to Russia. Trump's public doubting of Russia's culpability for interference in 2016 — though he later tried to "clarify" his remarks a day later — sparked bipartisan condemnation in Washington and sparked congressional lawmakers to look once again for ways to tighten sanctions on the longtime U.S. foe. Coats, a former GOP senator from Indiana, has until this week been a largely invisible figure in Trump's Cabinet. Earlier in the administration, his voice was drowned out by the more outspoken Mike Pompeo, who was CIA director before Trump tapped him as secretary of state. Now with Pompeo heading the State Department, Coats has been thrust into the limelight as the voice of the intelligence community.